Wow, I can’t believe that this is already Weekly Wrap #20! Time sure does fly, doesn’t it? I hope that you’re enjoying this feature, because I’m certainly having a fun time finding new and interesting gift wrap ideas. This week’s idea comes from eco-friendly lifestyle expert, Danny Seo, whose brilliant concept for turning leftover rolls of admission tickets into a fantastic wrapping paper/bow combo was a must feature. Love the subdued red and blue color palette that the tickets create! Who would’ve thought that admission tickets would make for such a sophisticated look? The idea is from Danny’s book, Simply Green Giving, and I actually think that I’m going to pick up a copy for myself over the weekend. If most of the gift wrap ideas in the book are as cool as this one, then I’m in for a real treat! Have a wonderful weekend, everyone, and I’ll see you back here on Monday! Disclosure: I will earn a commission on purchases made through the book link in this post. Please read the full disclosure policy for more details. 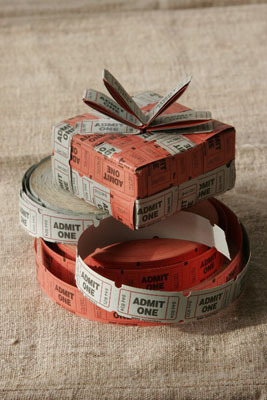 This is lovely, the tickets make a great bow for the top! Ooh, did you end up getting the book? I borrowed it from a friend and loved it! I’ve never seen a book that matched my aesthetic so well…it surprised me.